Anyone can dream up the perfect, memorable, and unforgettable wedding day, but the rubber meets the road when it comes to paying for it, and ultimately choices need to be made to suit the budget. 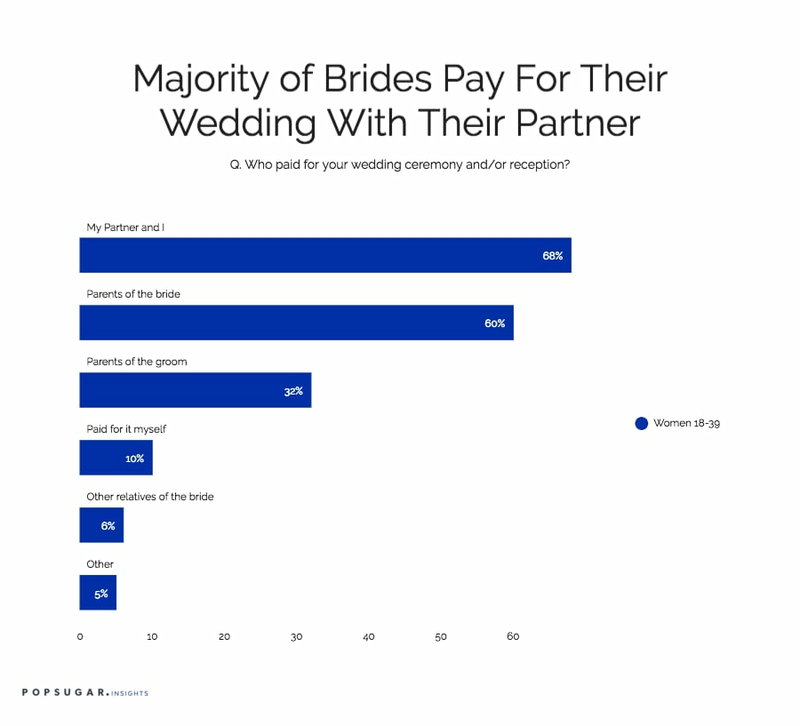 POPSUGAR Insights recently surveyed over 1,200 married or engaged POPSUGAR readers to learn who paid for the wedding and how much they spent. Overall, 68% of women said that they paid for their wedding and/or their reception with their partner. Six in 10 women said that their parents paid for the event, and 32% of women said the parents of the groom paid for the event. Ten percent of women said that they paid for the entire event themselves without any other support, and 7% indicated that other relatives of either the bride (6%) or the groom (1%) paid for their wedding and/or reception. In terms of the final bill, regardless of who paid for it, 61% of women said that they spent between $5,000 and $29,999 on their wedding and/or reception. Sixty percent spent less than $20,000 on their event, and 24% spent over $30,000 on their big day. Nine percent of women went all out and spent over $50,000 on their wedding and/or reception. In terms of individual expenses, 42% of women said that food and alcohol were the most expensive individual item purchased for their wedding or reception.